Trying to control every outcome can be exhausting and unfruitful – this card suggests it’s time to relax a bit and let the process unfold as intended. Trust in what you’ve done and let the Universe do its thing. Blessings and Happy Friday! I, the Lunar Mother, bring you my Mandala of the Moon to manifest through the law of magnetic attraction. My mandala is the sacred portal through which your dreams, intentions, and visions shall pass into the wholeness of being, from the realm of inspiration into the world of form on earth. 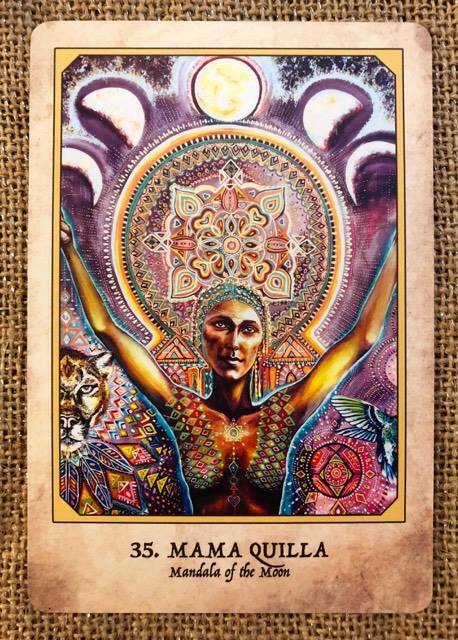 There is no need for doubt or concern, for even the appearance of delay signifies that the divine feminine mystery is at work, with timing unfolding according to a higher, loving wisdom. Trust that which is falling away is meant to be, while you have faith in new divine works being born. Meaning: This oracle brings a sign that creative works will reach fulfillment. Relax with trust and positive expectations that all your needs will be met. This makes it easier for abundance to flow and all earthly and spiritual matters to fall into place according to a great and loving higher intelligence. Things are changing, even if you cannot see the physical evidence of this as yet. Trust that your actions are leading you into a better way of life. Rely on the Universe, and you shall see how all things come together according to a timing and a higher order that suits you, in ways even better than you could have imagined by yourself.